The six weeks of Women Build 2018 concluded on May 19th and we cannot be more grateful for all of the hard work of our participants. 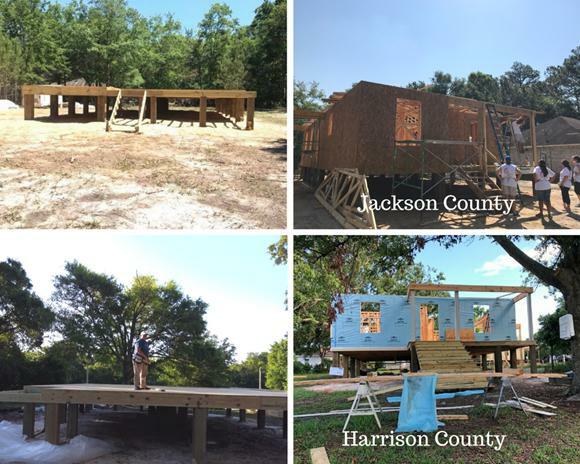 Over 350 women and men started with a flooring system and have hammered, sawed, nailed, raised walls, added strapping, installed siding, windows, and much more on our Harrison and Jackson County sites. These amazing individuals and our sponsors have raised $120,534 to help cover the costs of these homes. Fundraising continues until May 31st!! You can help us reach our goal of $200,000. 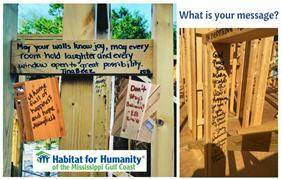 Donate to Women Build, or directly to one of our participants. Show them your support and let's make their sweat and dedication on the jobsite into a HOME! These pictures show the amazing progress made on our two Women Build construction sites. Women Build may have left the jobsite, but our work is not done. You may, or may not, know that many of our volunteers sign the boards in our homes leaving messages to future Homeowners. You can also do the same. Buy a Board and your message will be added to a board in the home. Help us reach our goal to fully fund both houses we are currently building and buy your board today. What will be your message? Click here to donate and leave your message for strength, stability, self-reliance and shelter. 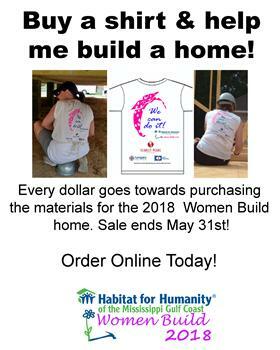 Here's an easy way to help the women and men of Women Build meet their fundraising goals and you get a Women Build shirt! Your purchase will be credited to the Team or Builder. 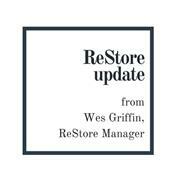 Our ReStore can be reached by calling 228.678.9100 and is located at 8022 Hwy 49 Gulfport, MS. Hours are Tuesday - Saturday 10:00 a.m. to 6:00 p.m.
To that we plead guilty, but only in part. The Gulfport ReStore certainly is full of amazing deals - with 50-75% off retail prices storewide - but unlike your run-of-the-mill thrift store, you don’t need a shovel to unbury them. Furniture is neatly staged with home decor like lamps and rugs to complement each piece and help you visualize your home transformation. Warranties for gently used appliances start at one month, while shiny new ones are guaranteed for a year to boost your kitchen confidence and your peace of mind. New windows, doors, cabinets and floors arrive daily to supply your next home improvement project. Brand new chrome and bronze vanity lights to upgrade your bathroom... plus a handful of stunning chandeliers! Remember... every dollar you spend and every item you donate helps Habitat provide strength and stability for local families through shelter. ReStores are an essential part of Habitat’s work in the community. Never has treasure hunting been so altruistic. We hope you’ll be a Repeat visitor. 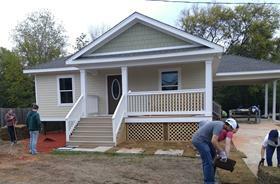 Interested in becomeing a Habitat Homeowner? Find more information on our website. Free financial coaching is offered to individuals, civic groups, churches, organizations, employers/employees, etc. Call 228.678.9100 for more information. EnergyWise is a program geared toward helping low-income Mississippi Power customers reduce their energy costs by providing free weatherization improvements for homes that do not meet current energy efficient standards. June 21, 2018 6:00 p.m. Spending Planning 101: An interactive one-hour course designed to encourage participants to take control of their money by examining their motivations, habits, and attitudes surrounding their personal finances. The purpose of the course is to assist participants in identifying and setting SMART personal financial goals, developing realistic spending plans, and choosing the tracking methods to best suit their family's lifestyle. The course is fun, interactive, and informative. Participants should bring or have access to a bank statement or spending trends for at least 30 days as well as a list of income and recurring expenses. July 17, 2018 6:00 p.m.
Financial Recovery: Designed to bring hope to families struggling to recover from a financial setback, this course will equip participants with proactive, practical strategies for getting back on their feet. The objective is to help participants visualize a brighter future and realize that their current financial difficulties don't have to be permanent. 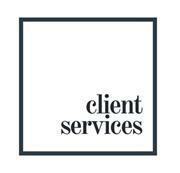 August 2, 2018 6:00 p.m.
Financial Foundations: Designed as an interactive course that addresses attendee's emotional relationship with money and calls them to take immediate action to improve their financial futures. The course will highlight the importance of building savings, developing a spending plan, and reducing debt. Attendees will have access to free one on one coaching for encouragement and support in applying each of the foundations. Registration for each course is free, however, registration is required by calling 228.678.9100, or by email. 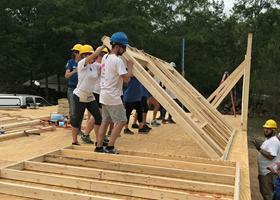 A BIG shout out to our entire Construction Department and our AmeriCorps members for all of their work on Women Build. In previous years we had one build going and this year we had two! 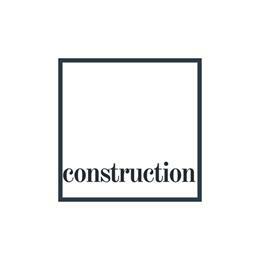 We appreciate all members of the construction team those on the jobsite and in the office. We are grateful for each of you! To all our sponsors, we thank you for your support. Together we build, strength, stability, self-reliance and shelter. Resumes accepted by email to jobs@hfhmgc.org or mail to 2214 – 34th Street, Gulfport, MS 39501. Cover letter along with three business and three personal references with contact information should be included. Applications will be considered on a rolling basis. The position will be open until filled. Primary Role: Under the supervision of the Construction Director, the Job Site Supervisor is responsible for managing construction on new or rehabilitated homes to meet the construction schedule, participating in construction activities as required and overseeing the labor force consisting of staff, sub-contractors, AmeriCorps, NCCC, Habitat family partners and volunteers. 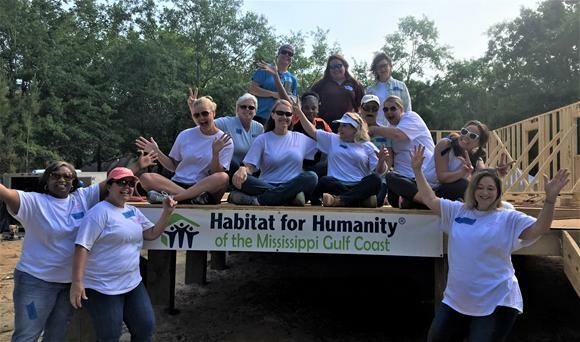 Be the catalyst for a growing set of nonprofit businesses along the Mississippi and Alabama Gulf Coasts, all supporting Habitat for Humanity! This Full-Time position can be based in either state and will involve some regional travel. Gulf Coast residents donate their unwanted furniture, appliances and building supplies to the Habitat ReStore for lots of reasons: to keep usable materials out of the landfill, to support Habitat’s home building and repair work in the community, and to provide affordable home improvement resources for their neighbors. But, all ReStore donors have one thing in common… Someone told them the “What, How and Why” of donating to ReStore! The ReStore Donations Manager (RDM) must be a dynamic individual with the drive to achieve and energy to match. He or she will be responsible for a quality corporate donation process from start to finish: lead development, donor solicitation, scheduling and acquisition, acknowledgment and relationship management. The RDM will fill the primary business development role for two existing ReStores located in Gulfport, MS, and Summerdale, AL, as well as a soon-to-be ReStore in Daphne, AL. These growing communities are experiencing a great deal of building and remodeling – and ReStores are flexible enough to “transform” with each unique opportunity – so the sky is the limit on our region’s donation capacity! Position will be open until filled. Applications will be considered on a rolling basis. 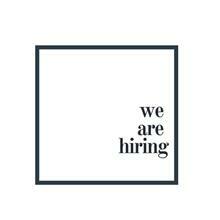 To apply, send resume with cover letter and 3 professional references to wgriffin@hfhmgc.org. For the complete description of requirements and experience for both positions, go to our website. Questions? Please feel free to reach us at 228.678.9100, by email at tellmemore@hfhmgc.org.